Le Boudoir is one of Montreal's better-kept secrets, a chance to pay dive bar prices on a delightfully varied assortment of local microbrews at cheap prices --like a bottle of Blanche de Chambly for $4 or less during happy hour-- without having to actually sit in a trashy, crappy dive bar. Let's put it this way. I can't find any gouging anywhere on the menu. And I took photos of every single page of it just to make sure. If something on there isn't cheap, then it's reasonably priced. Le Boudoir management? You have my respect. And Le Boudoir does chic-on-a-budget with the best of them too, offering a dozen kind of whiskeys including Japanese, Swedish and Indian varieties. As for scotch, oh glorious drink of the gods, let's just say I lost count after scotch #77 on the menu. From single malt to blends to smokey varieties, prices start at $5. As for food, well, there isn't much of that at this particular pub. Olives, almonds, basic nachos, and some higher end (but under-10-dollars affordable) pâtés and goat cheese snacks are available in-house, but you'll have to order out for a more substantial meal. Just ask the staff for some local flyers or recommendations. They're totally cool with patrons bringing in their own food so long as drinks are purchased. What About Catching the Game? Le Boudoir has large screens to catch the game, whether that game is hockey or the World Cup. 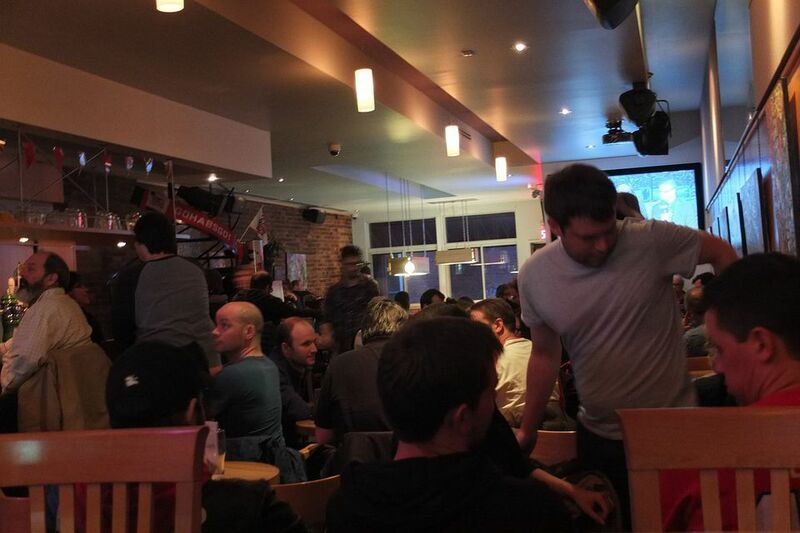 But what's great about the atmosphere here is not only does staff get in on the fun --they donned in Canadiens de Montréal warpaint last time I check in during playoffs-- but patrons are clearly enthusiastic about whatever is playoffs too. And here's the great part. They're not frat boy obnoxious about it. The crowd is a perfect balance of sports fans and random types who just came in for a beer. So much more elegant than a typical sports bar, yet down to earth and enthused. An amazing bring-your-own-food policy, a quality assortment of local and imported brews at accessible prices, like my favorite Cassis beer made by Éphemère, a lovely wine selection too (Pineau des Charentes, anyone? ), a crazy assortment of scotch AND sports screens in a visually-pleasing locale two minutes from a metro station? Pub heaven, my friends. Pub heaven. Le Boudoir: Dress Code, Etc. Casual dress is fine. Outdoor terrasse space available.